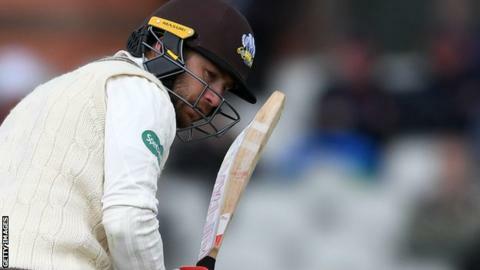 England opener Mark Stoneman again failed to fully press his case for Test selection in Surrey's Division One draw with Lancashire at Old Trafford. Stoneman made a patient 29, his highest score in four Championship innings this season, before he was caught behind down the leg side off Tom Bailey. Surrey, following on 204 runs behind after being bowled out for 235 on the final morning, ended on 199-6. Paceman Bailey took 4-13 in 19 overs for an impressive match haul of 8-67. After starting with two successive losses, Lancashire moved off the bottom of the table with the 12 points they gained from a rain-affected contest. Much of the attention on day four was once again on Stoneman, whose place in England's Test team could be in doubt if his recent struggles continue. He will have two further chances to impress in the County Championship - in home games against Worcestershire and Yorkshire - before the first Test of the summer against Pakistan gets under way at Lord's on 24 May. Having been dismissed for a fourth-ball duck in the first innings, the left-hander was in watchful mood along with opening partner Rory Burns (33) as they began Surrey's attempt to save the game. The pair survived until lunch and their partnership was worth 53 when Stoneman perished in the 27th over. Four wickets fell during the afternoon session, but stubborn resistance from Ben Foakes (57) and Ollie Pope (41) in a fifth-wicket stand of 86 prevented Lancashire from gaining their first win of the season, despite Bailey dismissing both men late on. "The effort from the lads was superb. As good as you will see in this division. We controlled virtually every session of the match. But it would have been an unbelievable effort to win in three days on that pitch. If it had gone the four days, I think we would have come out on top. "Everyone's disappointed in the results from the first two games but they were both affected by weather. The performance here is what we are all about. We can take a lot of confidence from it and move on. What pleases a coach the most is the purpose they've shown and the fight to win. "Tom Bailey has shown his attributes. He bowls some lively spells. He's got the ability to get the ball through. He gets bounce because he's tall and he controls the seam. He's holding his length fantastically well and he can be very miserly when he needs to be. Bowling on a flat pitch he has all the attributes for that." "I'm really pleased with the character. We set ourselves the target of saving the game at the start of the day and we've done that, so that's ticking a box, but over the three days we weren't good enough. We were outplayed but we've still come away with a draw. "Ollie Pope and Ben Foakes were excellent. That partnership was crucial for us at that stage. "They bowled very well all game and showed us how we should be bowling and they showed us how we should be batting."